This week marked an important little landmark in my Etsy journey -- I have sold more items than currently have listed (57 sales; 56 items at the time!). It's always funny to see how giddy I get when I get a message on my (new) Blackberry saying that I sold an item on Etsy! Makes me feel alive and reminds me why I have spent so much time and money in this crazy hobby of mine! I finally added some new items to my Etsy site today. Two new pieces with quotes behind them need particular attention: The first one I especially love. I bought these precious little sterling silver rose charms awhile back and have been waiting to figure out how to use them perfectly. When I was thinking of finding a scripture to go with the rose, I was reminded of the passage from the Sermon on the Mount: "Has anyone by fussing in front of the mirror ever gotten taller by so much as an inch? All this time and money wasted on fashion—do you think it makes that much difference? Instead of looking at the fashions, walk out into the fields and look at the wildflowers. They never primp or shop, but have you ever seen color and design quite like it? The ten best-dressed men and women in the country look shabby alongside them." ~ Jesus (Matthew 6:27-29; The Message translation). Love 'em. Next on the list - this little sparrow resin charm I have had for MONTHS. When I was in Baltimore I found these really cute Czech orange beads that just screamed "Buy Me!" I am glad they go so well with the charm. Happy is the person who not only sings, but feels God's eye is on the sparrow, and knows God watches over me. To be simply ensconced in God is true joy. ~Alfred A. Montapert Also posted several new items on Etsy today (finally). I have been in a rut and have not found the strength nor the time to make jewelry in over a week (long story short - my parents drove all the way to LA from KY to visit for a few weeks, and on the 3rd day here my dad was admitted to the hospital and had to have emergency surgery. He's thankfully fine now, and yesterday when he returned home I was happy enough to finally get back to the creating table. Funny how the two are correlated!). While I was in Chicago I also found some GREAT cinnabar beads, which I really wanted for a reprise to this bracelet: Glad it turned out as envisioned, and this time with nicer materials (nice glass and beautiful, Chinese textured beads!! On an unrelated note, I discovered "Craft Cult's" Heart-o-matic feature today -- a website that tracks your Etsy store site. Why have I never heard of this place before? Now it's easy to see who "hearts" my store and items without having to click on each one, one at a time! Wahoo! Lastly, I got pictures of the sari that my friend Chrissy is wearing to this wedding (she asked me to make a few sets of earrings and necklaces for the wedding eventS - she's on the right). I am thinking crayon green and yellow crystals and gold wire. Thoughts? As always, thanks for reading! Have a great weekend! Of course anything you make will be perfect! But I like the idea of you bringing the green and yellow into it! Hi, I really love all the good pieces that you made. They are beautiful and special. Keep it up! so glad we popped in today..
creating this blog has made me feel giddy..
love it and all the wonderful people we have met in the last 6 months..
Congrats on all your sales. The jewelry looks great. I love saris. What a fun project to make coordinating jewelry for them. 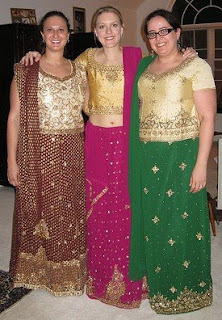 Goodness I look awful in that photo- it was about a hundred degrees in there with all of us trying on sarees. Heh. I'll send you some detail shots soon.